In the early years of air travel, just the experience itself, left passengers in awe. It was a unique and new transportation option that only few could enjoy. As air travel expanded and became more common place, the romance was lost. Personalized attention, wonderment and excitement was replaced with cumbersome processes and anxiety ridden travelers. A renewed focus on the passenger experience aims to bring the romance of air travel back. Corgan has identified key trends that our team of designers are integrating back into our designs to do just that. Mobile technology has redefined daily life. Friendships are maintained through social media and news is disseminated through tweets in 140 words or less. Likewise, how passengers interact with airports and airlines has changed. 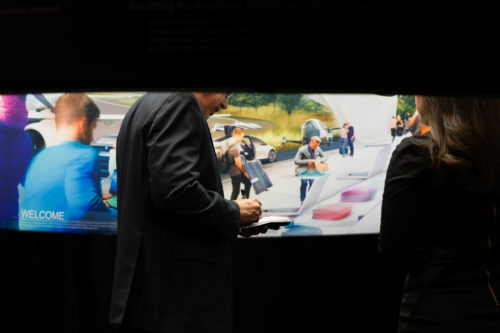 Immersive technologies allow passengers a seamless, connected journey that empowers them before, during and after their time at the airport. At the root of this trend, is the ability for the passenger to personalize their airport experiences. Even before arriving at the airport, passengers, via their mobile device, can view and make changes to flight details, get their boarding pass and even pre-order concessions and other retail items to be available upon arrival. After going through security, retailers, with more data than ever before, can provide personalized offerings tailored to each passenger’s needs. Passengers can order food to be delivered to their specific location, track their luggage, and schedule a driver to pick them up at their destination, all via a mobile app. The right design needs to be in place to support this trend. Airports need a strong network backbone, with enhanced internet connectivity and access to power for devices, so it can support the influx of digitally based innovations on the horizon. Additionally, concessions and back of house spaces need to be nimble and flexibly designed so they can quickly adjust as new offerings become available. Ultimately, airports and airlines benefit from happier passengers and more profitable retailers. In addition to personalizing the passengers’ airport experience, there is a distinct trend towards the automating passenger processing. Self-service devices, with self-bag tagging and a self-bag drop has become the norm in the ticketing hall. This trend’s influence can also be seen in many security and immigration processing areas as well. TSA Pre-✓® has streamlined the security process for many during the departures process and Global Entry is doing the same upon arrival. The trend towards automation will be enhanced with the use of biometric screening. Fingerprinting and facial recognition have already improved immigration processing, and we believe this technology will soon be seen throughout all airport processes. Check-in will occur through facial scanning when you step on the terminal curbside, security screening will take place sans lengthy lines, but instead as you walk through the vestibule entering the terminal, and boarding passes will be replaced by a fingerprint scan. A renewed focus on the experience has been seen across the globe. Airports have become a reflection of the surrounding community celebrating the culture and locality. Local music has taken stage in concession nodes to draw in passengers and entertain them while they wait. Green spaces highlight the surrounding natural landscape and provide a place of respite to calm passengers and reduce the anxiety of travel. Local art gives passengers the opportunity to connect to the city one last time before departing. Experiential design focuses on an understanding of who the passenger is and what their needs are, and then crafts a unique response to this to enhance their airport journey. Whether the need is the efficiency a business traveler demands or the relaxed, comfortable environment that an explorer would thrive in, the goal is to lower the passenger’s stress levels and increase their desire to see more and enjoy more in the airport. As travelers continue to demand more, Corgan is designing for experience, creating memorable journeys, and elevating airports beyond the expected.